On Tuesday morning we had two cases with Mr. Hubble. The first was a revision hip replacement with impaction bone grafting of the acetabulum and a cement-in-cement femoral revision. Mr Hubble was working with one of the fellows who was from Australia. On the second case the fellow went through a standard primary total hip replacement. When the cases were done, Michael and I grabbed our luggage and took a taxi to Mr. Howell’s house. When we arrive at Mr. Howell’s house he had laid out a traditional “Devonshire Cream Tea” for us. This delightful treat involved fresh scones with clotted cream and fruit preserves, alongside a cup of tea. We sat and at our cream tea with Jonathan and his son, gazing out across the rolling hills of the Devonshire countryside. When we had finished, we put our luggage in his car and headed to the airport in Bristol to catch a plane to Belfast. As we drove along the M5 to the airport in Bristol I could see thunderstorms to the east and the sun shining in the west. For a brief time, a rainbow followed our car, highlighting our time in Exeter. It has been an incredible experience here, and I am looking forward to capping it off at the British Orthopaedic Society Annual Meeting in Belfast. Unfortunately our plane was delayed by two hours, but Mr. Howell got us into a comfortable airport lounge where we could relax. I took the opportunity to share the films of a complex total hip patient. It was a wonderful to listen to his advice and collaborate on a patient together. He was so intrigued by the case, he asked to include it into an expert panel on complex total hips that he is chairing at the upcoming BOA meeting. I was delighted to provide the slides for him. Ultimately we got to Belfast quite late, but we checked into our hotels without any problems and settled into our final living quarters before the journey home. On Monday I rode with Mr. Hubble to the hospital to spend the day doing total hip replacements with Mr. Howell. Mr. Howell had three total hip replacements on that day. Gee took time before each case to show me the preoperative templates they had created. I was impressed by the careful consideration of details with each case, as well as his deep understanding of the options available with the Exeter prosthesis. The plans involved three cemented stems along with three cemented acetabular components. All three cases were performed through a standard posterior approach, with the exception of the middle case. During that case Mr. John Timperley scrubbed in and showed us an innovative new approach that he has been working on. Despite the fact that this was not his case, and he was not scheduled to be operating, Mr. Timperley was more than happy to demonstrate his new technique for us (as well as his colleagues). His eagerness to teach us was something we have experienced throughout this fellowship, and is truly what makes this opportunity so amazing. After cases were finished we went back to the administrative offices where the Exeter group had planned a brief educational session for us. Mr. Graham Gie gave an excellent lecture on the history and design rationale of the Exeter stem. In addition, we had lectures on impaction bone grafting, treatment of periprosthetic fractures, and treatment of hip fractures with the Exeter stem. The conversation was excellent! After the educational session we briefly stopped home before being taken to The Pig Hotel at Combe for our dinner. The Pig is an old estate that has been converted to a hotel and restaurant. We toured the grounds including the vast vegetable gardens and chatted with the consultants from Exeter and their wives. The dinner was amazing and the company was fantastic. I had a great time talking about the Exeter stem design with Graham Gie. Though the night went rather late I went home with the now all-too-common feeling that I was just very, very lucky. On Sunday morning we had a little leisure time before John Hodgkinson picked us up to take us to his house. The plan was to get in a little physical activity, have a nice lunch, and then John would drive us to Manchester airport to fly down to Exeter. Tim Board met us at John’s house, and brought his running apparel with him. I also brought my running apparel, but Tim is in much better shape than I am! We decided to go for a run around the Holcombe Moor which is where John’s house is. So I laced up my running shoes, and Tim ran me for 5 miles up and down the English countryside. By the time we made it back to John’s house, John and his wife and Michael had just returned from their walk. We were all ready for lunch and a little bit of relaxation. After a shower, and a quick change of clothes, I joined the group for some wine and lunch on their beautiful patio. As we ate, we sat and talked about our experience. Given the time that John has been an orthopedic surgeon, we gained tremendous insight from him and his history. He has truly been in one of the great centers of orthopedics and has seen firsthand orthopedic innovation. It was an honor to simply sit with him, and hear him tell his tales. Like so many of the other hosts we have dealt with before I was awestruck by his humility. When lunch was done we piled into John’s car and he drove us to Manchester airport. We said our goodbyes, and boarded the plane to Exeter. After another short flight we were greeted at the Exeter airport by Mr. Jonathan Howell. Jonathan is a great guy with a contagious smile, and he drove us into City center. He briefly showed us the Exeter Cathedral, which was built just a few short decades after the Norwich Cathedral, and also by the Normans. We grabbed a quick pint at a local bar, and then headed down the street to a wonderful restaurant to meet the rest of the group. At the restaurant, we were joined by Mr. John Timperley, Mr. Matthew Hubble, and Mr. Matthew Wilson. We joked that to be on the Exeter hip team, one needed to be named “Matthew” or “John”. We discussed all of the places we visited, the usual topics of conversation (of course Donald/Hillary included), and shared a lovely evening together. While most places had put us up in a hotel, in Exeter Michael and I were each sent to stay with one of the consultants at their homes. Michael stayed with Mr. Timperley, and I stayed with Mr. Hubble. It was a very warm and welcoming gesture on their behalf. At Mr. Hubble’s house I had the pleasure of meeting his wife, and three of his four children. Their house was lovely, the accommodations immaculate, and they even had candles lit for me. I went to sleep that night reflecting on how lucky I am to have this type of experience. On Saturday morning Michael and I were invited to attend an introductory meeting for a new group that is forming in the Northwest UK to support Orthopaedic training in Africa. Having some experience with medical mission work in Nicaragua, it was comforting to hear that this group was already anticipating some of the pitfalls of bringing help to third world areas. Their hope is to bring sustainable training in Orthopaedic trauma to Ethiopia to address what is a major public health risk. It was a lovely discussion and I look forward to seeing what comes of it. After the the meeting we were picked up by a taxi to take us to Liverpool for the football match. We went to Albert Dock in Liverpool to walk around for a while. We walked the dock and enjoyed the fresh reeve off the Mersey. Liverpool is famous, of course, for the Beatles so we ended up at a Beatles museum which was great fun. Following our museum tour we grabbed another fab to Anfield Stadium. The air at Anfield was completely electric. Michael and I both bought Liverpool scarves on the way into the game so the locals knew we were on their side. We headed to the main stand and found our way to the hospitality suite. In the main hospitality suite they had laid out tables for a four course dinner. Unfortunately the entire wait staff, kitchen staff, and plumbing were overwhelmed by the crowds and everything (including the water) ground to a standstill. Just after game time we wandered out to our seats to be among the rest of the crowd. This is my first Premier League game and I was completely blown away! Liverpool fans were singing and clapping in unison. It was most impressive. I could make out Rodgers and Hammerstein’s “You’ll Never Walk Alone” but they sang so much more. The best part is that Liverpool won 4-1 in front of the home crowd. What an experience! After the game we shared a cab with some local Liverpudlians back to city center. We ended up hanging out with them for a few hours and seeing the city’s nightlife. They were great hosts, and we had an excellent time! On Friday morning Nikhil picked up Michael and I to take us to Wrightington Hospital. The plan for the day was to start with a conference, then go to the operating theatres, tour the Charnley museum at the hospital, and then go out for dinner. For a hip surgeon, Wrightington Hospital holds a special place among famous Orthopaedic centers. Wrightington is an old tuberculosis hospital in the middle of the countryside. In the 1950s, Sir John Charnley moved here to find a quiet place where he could work on developing various Orthopaedic implants, tools, and devices. It was here that he invented the Charnley low frictional torque arthroplasty in 1962. His implant, and the concepts that came with it, created the first successful total hip replacement and directly led to the success of our modern joint replacements. Visiting here is like visiting Graceland (if you’re an Elvis fan), or The Cavern (if you’re a Beatles fan), or The Globe (if you’re a Shakespeare fan). Quite simply, it’s where it all began. 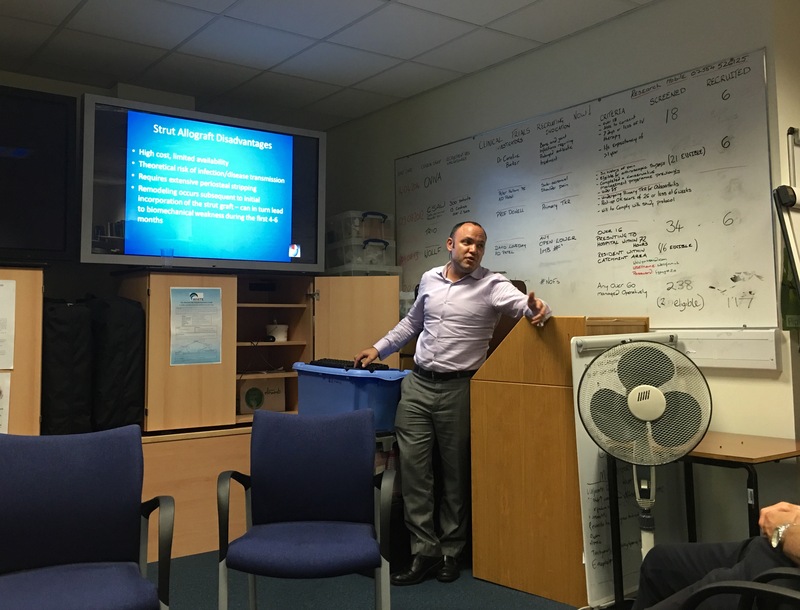 So to be taken into a room with registrars, fellows, and consultants at Wrightington Hospital and give a talk about hip disease is an incredibly humbling experience. But what makes it humbling is the location. The people we met are incredibly gracious hosts. There is no pretense, no attitude, and no judgement. Quite simply they are a fantastic group of surgeons who approach their work assuming that they can learn something new from everyone they meet. After our presentations We briefly sat down with Mr. Martyn Porter who presented us with tickets for a football match in Liverpool the next day. The match was Liverpool vs Leicester and was being held at the newly renovated Anfield Stadium in Liverpool. They had gone all out and gotten us a hospitality package that included dinner and drinks. Martyn was almost giddy as he described to us what to expect at the game the next day. Then we went to the operating theatres to see a total hip replacement almost exactly like how Sir John Charnley would have done it. We alternated scrubbing with Mr. Bodo Purbach on two total hip replacements. I can best describe Mr. Purbach as a disciple of Sir Charnley and his protégé, Mr. Michael Wroblewski. He was delightfully informative, technically skilled, and charmingly entertaining. He did not shy away from controversy and encouraged challenging conventional thought. When we were done in the theatre we met with Mr. John Hodgkinson who took us to the original Wrightington operating theatre that Charnley worked in. Not surprisingly it looked like any other operating theatre in any other hospital that I’ve visited. He also showed us an exhibit in the hospital that was dedicated by a woman who had undergone bilateral total hip replacements by Sir John Charnley almost 40 years ago. She is in her 90s now and her hips continue to be trouble free for her. We then got a private tour of the Charnley Museum, which is currently located in temporary quarters. There were all sorts of implants, tools, and equipment there. Some represented failures, but many represented successes. All of it was a direct result of the hard work, persistence, and ingenuity of Sir John Charnley. As part of the tour we were also given several books, published by the Charnley Trust. The books included a reprint of Charnley’s book on fracture treatment, and a book of collected writings about Charnley after his death in 1982. After the tour we were taken to dinner at the High Moor restaurant nearby. This place was a favorite of Charnley’s and frequently hosted meetings of the “Low Friction Society.” Dinner was excellent and included several consultants as well as Michael and I. Discussion included the typical issues such as Brexit, Donald/Hillary, total hip nerdiness, and the usual round of jokes. We all had a great time. When we reached the hotel we anticipated a great night’s sleep and visions of a victorious Liverpool in our heads! Norwich has an important part in the history of orthopaedics and, particularly, hip replacements. The McKee-Farrar metal-on-metal prosthesis was developed there in the 1960s. Mr George Michael McKee was a giant in the treatment of hip disease, and was a close friend ofSir John Charnley who is credited with popularizing the modern total hip replacement. Tommy (HA) Brittain was the inventor of the extraarticular “ischio-femoral arthrodesis” for the treatment of hip tuberculosis in the 1930s. He apparently got the idea for the technique while looking at some specific flying buttresses that adorn the outside of the Norwich Cathedral. Norwich Cathedral was built by the Normans after their invasion in 1066. While the cathedral was a Catholic cathedral originally it was subsequently converted to the Church of England after Henry VIII had some minor disagreements with papal doctrine. Apart from the cathedral, the Normans also built Norwich Castle as a reminder to the locals who was in charge. Norwich was also the main HQ for the American Air Force during WWII. There were literally dozens of airfields around Norwich and the major airfield has subsequently been turned into Norwich International Airport. Michael and I spent this morning in the theatre watching a knee revision. Following that we were allowed out on a beautiful sunny day to explore Norwich. Jo Nolan dropped us off in the city center where we walked around Norwich to see the sites. After a tour of the cathedral we wandered around Bishop’s Gardens and then headed into the old town pedestrian district to walk around. Jo picked us up to take us to the airport in time for our flight to Manchester. A short flight later we were greeted by Mr. Nikhil Shah, a consultant from Wrightington Hospital. He drove us to his favorite Indian restaurant so we could have some dinner, and then took us on to our accommodations at the Wrightington Hotel and Country Club. Our last morning in Glasgow started early so we could catch our 6:45 am flight to Norwich through Manchester. The taxi arrived at 5:15 am and we got to Glasgow airport with enough time to grab a small breakfast. Thankfully our flights were uneventful and we touched down in Norwich a little after 10:00 in the morning. We were met at the airport by Jo Nolan, wife of Mr. John Nolan, one of the consultants in Norwich. She drove us to the hospital where we met our guide, Amresh Singh. Amresh is the current hip fellow in Norwich. He’s a lovely chap with a real inquisitive mind about how things work in the United States. Amresh took us to clinic to see a real, live NHS clinic in action. The consultant in clinic, Mr. Jim Wimhurst had a collection of radiographs ready to review with us. By this point it was nearly lunch time and Amresh took us to the hospital canteen. After lunch we finally got the chance to meet Mr. Nolan, and he was certainly worth waiting for. His easygoing charm and friendly smile immediately made us feel right at home. We sat in his clinic and reviewed several of his talks on topics like complex primary total hips, treatment of periprosthetic fractures, experience with metal-on-metal total hips, and the results of femoral and acetabular impaction grafting. He had a tremendous wealth of fascinating cases, and such a wonderful way of presenting them. Finally, he gave us a brief presentation on Norwich itself. He displayed such pride in the town he now calls home, it was charming to see. When we had finished in his office we went to the McKee Room for a conference with the whole department. Michael and I gave our presentations, like we had done in London at the BHS meeting. They were attentive and asked great questions, despite us going over our time. After our presentations they showed us some challenging cases and we all discussed what to do. These conferences are always amazing in that they highlight the variety of approaches and options for treating hip disease. When the case presentations finished, John drove us (and his middle son, George) back to his house, where we would stay for the night. He had also planned a barbecue for us, and everyone from the department was invited. It also turned out to be the birthday of John’s youngest son, Archie. We had great conversation, shared jokes, ate, drank, and sang happy birthday. After too much food, cakes, and English bitters, everyone headed home. The rest of us helped tidy up before heading inside.